For the past decade, the political battle over what is called the “right to die” has been raging across our nation. Those who deny the exis-tence of such a right have lately had some reason to hope that the grim tidal wave of “progress” predicted by the Hemlock Society and the ACLU would not come to pass. Only one state has enacted an assisted suicide statute and similar proposals have been rejected by several others. The governor of New York commissioned a task force to study the issue and the members unanimously agreed against recommending a change in New York law to permit assisted suicides. But once again, federal judicial action threatens to trump the democratic process and imperiously declare a national winner in this bitterly divisive debate. In the case of Compassion in Dying v. State of Washington, the United States Court of Appeals for the Ninth Circuit decided on March 9th that “there is a constitutionally protected liberty interest in determining the time and manner of one’s own death,” and struck down Washington’s prohibition of physician assisted suicide for the terminally ill. Instead of submitting itself to the constraints of the Constitution—whereby most issues of grave societal consequence are to be struggled with by the people until broad public consensus is reached—the Ninth Circuit has seized the king’s crown and issued an edict designed to end debate. The following is a synopsis of the court’s stunning rationale—its self-described “reasoned judgment,” which it has the temerity to claim is based on history and precedent. The court notes that in Ancient Greek and Roman society, philosophy and literature, suicide was considered noble in many instances. Then, interestingly, it points to the zeal for martyrdom among the early Christians as clear evidence of a Church-sanctioned, natural human desire to hasten death. The court admits that St. Augustine spoke out against suicide and the overzealous martyr, but it explains this by declaring that his concerns were “utilitarian,” that is, he did not want the Church’s ranks to be depleted. (I am not making this up.) As the court sees it, the unfortunate utilitarianism of Augustine eventually developed into full-blown medieval anti-suicide doctrine, resulting in such deplorable practices as burying suicide victims at crossroads and driving stakes through their hearts. This dark dogma was dispelled by the enlightenment, which tore at the superstitious underpinnings of the Church’s irrational opposition to suicide. 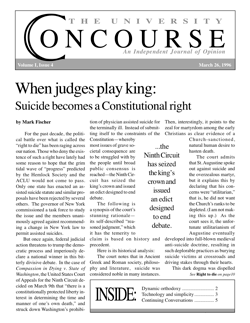 By the nineteenth century, courts and legislators had stopped enforcing anti-suicide statutes. Now, (the court seems to say) the time has come to complete the “good work” begun at the enlightenment, and legally recognize everyman’s right to a comfortable death. Liberal jurists, not generally known for their commitment to historical analysis, have evidently found that it can be quite useful in this age of deconstruction. I doubt whether this is what Justice Scalia had in mind when he lamented Constitutional analysis divorced from history and tradition. I quote: “We see no ethical or constitutionally cognizable difference between a doctor’s pulling the plug on a respirator and prescribing drugs to cause death.” Death results in both cases. Death is the intent in both cases. Such unrespectable analyses give credence to the accusation that federal judges have taken on the role of amateur philosophers. Crucial, life and death distinctions agonized over by theologians, philosophers and medical ethicists are casually waved away by these judicial idealogues. Anyone else reminded of “pro-choice” instead of “pro-abortion;” “fetus” rather than “child”? The state argued that the disabled and poor will be vulnerable to those who see their lives as useless. The court found this argument to be a “recycl(ing of) one of the more disingenuous and fallacious arguments raised in opposition to the legalization of abortion.” As they see it, the real concern is that the disabled and poor “will not be afforded a fair opportunity to obtain the medical assistance to which they are entitled—the assistance that would allow them to end their lives with a measure of dignity.” And, in any case, they are confident that “adequate safeguards” will guard against the remote occurrences of abuse. Although the court gave lip-service to the line of decisions regarding the refusal of medical treatment (with Cruzan being the principal decision), the focal point of its analysis of legal precedent was Planned Parenthood v. Casey, the controversial Supreme Court abortion decision in which Roe v. Wade survived by a single vote. In analyzing a person’s constitutional liberty interest, the Casey Court wrote that: “At the heart of liberty is the right to define one’s own concept of existence, of meaning, of the universe, and of the mystery of human life. Beliefs about these matters could not define the attributes of personhood were they formed under compulsion of the State.” This has become the mantra of constitutional law—the right to “define oneself” and the right to be left alone. No reference to the impact of individual actions on society as a whole. The uninhibited self is the sole arbiter of the validity of actions. In other words, maybe he wasn’t terminal, but—oh well—he died peacefully. Mixing pseudo-history, pseudo-philosophy, pseudo-constitutional law and story-telling, the court takes over ninety pages to find a constitutional right to die. The “right” is limited to the terminally ill, but one can expect the next decision to hold that there is no distinction between terminal illness and short-term illness or between physical pain and psychological pain. The individual must be allowed to define his own vital boundaries. Mark Fischer is a Pittsburgh attorney, an alumnus of the class of ‘89 and Contributing Editor of the Concourse.